Your bar’s forecasted sales are the sales you expect to take in over a given time. Many people recommend you start your exercise in forecasting here. If you don’t know how much money you’re making, you can’t figure out what you can spend! In the following example, you are shown a forecast for a tavern in the Midwest. It has 14 bar stools and six 4-top tables, for a total seating of 38 people at any one time. Of course, in bars, people do stand and drink during peak times, so we’ve taken that into account as well. To start forecasting, estimate how many people will be in your joint at different times of the day (often called your number of covers), and how much each person will spend (usually referred to as the check average, abbreviated C/A in the figure). Change is inevitable in every industry. In recent years some POS systems have decided to use the term per-person-average (PPA) instead of check average. To confuse matters further, those same systems use the term check average to mean the actual amount of each tab regardless of how many people are in the party. So if you’re using a POS system, make sure you know how your system talks about this important number. Predict how many patrons you will have at each meal period. We’re looking at 25 lunch patrons during the early weekdays and 30 lunch patrons Thursday, Friday, and Saturday. Estimate what each patron will spend. Based on our menu, it is estimated that each person will spend, on average, $7 on food and $4 on a drink during lunch. Notice average is used. Some patrons may order iced tea at $1.50 with free refills, while others will order three martinis at $7 each. It’s not an exact science, but you gotta start somewhere. Multiply your covers by your check average to get your total sales for the day. We recommend breaking down food and beverage sales separately, so you can see more specifically where you’re taking in money. 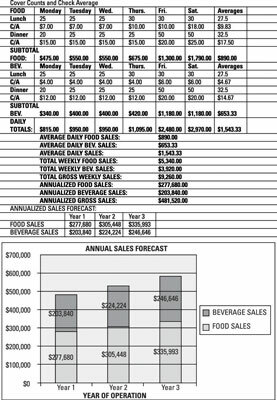 Add your total sales for each day together and divide by the number of days to get your weekly average. Multiply your weekly average by 52 weeks to get annual sales. Estimate your growth percentage year over year. In our example, we’re planning on growing our sales by 10 percent each year. So you would multiply our Year 1 numbers by 1.1 (or 110 percent) to figure out how that percentage translates into real dollars. This example is a simple representation of an average week. But many say that in this business there are no average weeks. Make sure you take into account any seasonal events that may affect your business, such as sports seasons, resort-based ebbs and flows, and holidays.